Thursday, April 12, 2018, 7:08 PM -	The Gulf Stream, the current of water that delivers heat from the equator to the North Atlantic, has been weakening for the past 150 years, and according to new research, it is now at its weakest point of the last 1,600 years. As global warming and climate change whittle away at Arctic sea ice and Greenland's glaciers, these losses are a concern for several reasons, such as sea level rise, loss of Arctic wildlife habitat, and the increased trapping of heat in open Arctic waters. One other concern that is becoming more important, as climate scientists do further research, is the potential weakening or breakdown of the Gulf Stream current. 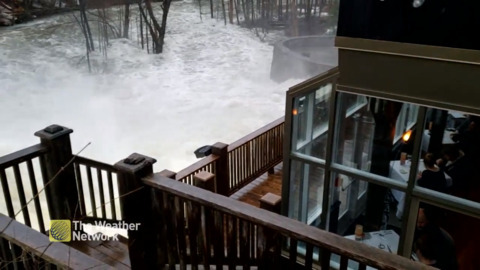 This current, which carries warm tropical water up the east coast of the United States and across the North Atlantic to western Europe, is an important part of our planet's climate system. 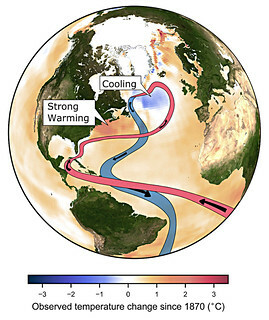 It not only is responsible for the warmer climates of western and northern Europe, but as the waters release their heat and sink into the depths of the ocean along the coast of Europe, the current joins up with the rest of the Atlantic Meridional Overturning Circulation (AMOC), and the overall Global Ocean Conveyor Belt, which deliver heat and salt through the ocean, across vast distances of the planet. 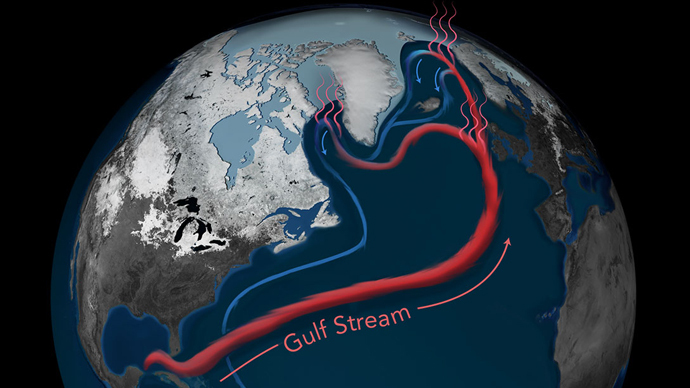 A slow-down, or even break-down, in the Gulf Stream, therefore, is expected to cause a dramatic shift in the weather patterns across Europe, and could have more far-reaching impacts, as it disrupts the larger, global circulation, as well. Now, two new studies published in the journal Nature are presenting evidence that, since the beginning of the Industrial Revolution, there has been a definite weakening of the Gulf Stream, such that the current is at its weakest point of the past 1,600 years. The two studies approached the issue from opposite angles. One, led by David Thornalley of the University College London and Woods Hole Oceanographic Institute (WHOI), looked at the ocean floor, and how changes in the sediment deposits related to changes in the strength of the current - specifically, that a stronger current delivers larger sediment grains to the deep ocean floor, and a weaker current can only deliver smaller grains. "Our study provides the first comprehensive analysis of ocean-based sediment records, demonstrating that this weakening of the Atlantic’s overturning began near the end of the Little Ice Age, a centuries-long cold period that lasted until about 1850," Dr. Delia Oppo, a senior scientist with WHOI, and co-author of the Thornalley-led study, said in a WHOI news release. The other study, led by Levke Caesar of the Potsdam Institute for Climate Impact Research (PIK), examined the latest sea surface temperature records, combined with the use of advanced, high-resolution climate simulations, to see if current temperature trends matched what was expected due to a breakdown in the AMOC. "We detected a specific pattern of ocean cooling south of Greenland and unusual warming off the U.S. coast - which is highly characteristic for a slowdown of the Atlantic overturning, also called the Gulf Stream System," said Caesar, according to a PIK press release. "It is practically like a fingerprint of a weakening of these ocean currents." Even looking at this from such different perspectives, both studies found similar results. "Combined, these approaches suggest that the AMOC has weakened over the past 150 years by approximately 15 to 20 per cent," Thornalley said in the WHOI news release. The reason for this weakening is also consistent across both studies - the injection of fresh water along the surface of the north Atlantic, from both melting Arctic sea ice and from water pouring into the ocean from melting Greenland glaciers. As this cold, fresh water slowly mixes with the warmer salt water, it cools the northern stretch of the Gulf Stream and it dilutes the salt water, reducing its density. Under normal conditions, when the waters of the Gulf Stream transfer their heat to the atmosphere across the north, that water becomes dense enough to sink rapidly and continue along the rest of the AMOC. The lower-density sea water resulting from the mixing in of freshwater from the Arctic and Greenland, however, would not sink as readily, thus slowing down the whole system. The last slowdown of the AMOC was found to be at the end of the Little Ice Age, during the mid-1800s, when there was an increased rate of melting of northern glaciers and Arctic sea ice. This is attributed to a number of causes, such as an increase in solar output that began in the mid-1800s and finally leveled off around 1940, an increase in volcanic activity at the time, and even the large amounts of soot being releaesd into the air from burning large amounts of coal, which then settling out of the air onto glaciers, decreasing their albedo and increasing their melting from absorption of sunlight. With the output from the Sun on the decline since the mid-1900s, and the air clearing of soot due to decreases in coal use and regulations on coal emissions, there has still been another surge of warming, and melting, over the past few decades. The current warming is due to increases in greenhouse gas concentrations in Earth's atmosphere.